Here in Charlotte NC and surrounding areas in Mecklenburg and Cabarrus County, tiny green worms emerge in early Spring when temperatures stay consecitively warm. These small worms live by feeding off tree foliage. Tree health is compromised when cankerworms damage the trees canopy and can hurt the overall well-being of the tree if not stopped early in the spring season. This spring, if cankerworms are evident in your trees our Certified Arborists suggest a plant health care treatment of systemic pesticide. This pesticide treatment is applied at the base of the tree, where the tree will then absorb the pesticide up through the tree into the canopy. Once the small green worms have eaten the leaves absorbed with the potent pesticide they die almost immediately. This effective pesticide treatment should be done by a Certified Technician who has access to certain equipment and product tailored especially for cankerworms; ensuring no additional harm is brought to the tree canopy. 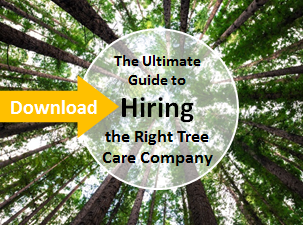 Before letting just anyone on your property, equip yourself with what questions to ask potential tree company prospects; find those right questions in our Ultimate Guide to Hiring the Right Tree Care Company. Cankerworms attack the canopy of the tree and over time can jeapordize the overall health of the tree creating an opportunity for other pest and disease issues to arise. If cankerworms are an issue in your yard, it is wise to consult with a Certified Arborist to determine what treatment would be best to protect the longevity of your tree.